Even though support for Democrats has declined among Latinos, the party still holds a wide advantage over Republicans in the congressional vote. Meanwhile, voter interest and motivation this year is unchanged relative to 2010, but continues to lag all registered voters. About half (53%) of Latino registered voters say they are absolutely certain they will vote in this year’s election, according to the new survey. This is statistically unchanged from 2010 when 51% of Latino registered voters then said they planned to vote. There are differences across Hispanic demographic subgroups in the share of registered voters that says they are absolutely certain they will vote this year. For example, those who have at least some college education are among the most likely to say they are absolutely certain they will vote in November. Some 65% of this group says this. Similarly, 63% of Hispanic registered voters ages 65 and older say they are absolutely certain they will vote this year. Meanwhile, intent to vote is lowest among those with lower levels of educational attainment. Just 39% of Hispanic registered voters with less than a high school diploma say they are absolutely certain they will vote this year as are 44% of Hispanic voters who have a high school diploma. The survey also reveals a few other important differences in turnout intent. Among Latino voters who have given “quite a lot” of thought to this year’s election, 73% say they are absolutely certain they will vote in November. By contrast, just 42% of those who have not given the election “quite a lot” of thought say they will vote in November. Latino voter turnout reached a record 6.6 million voters in 2010, resulting in a turnout rate of 31.2% among eligible voters and 60.5% among registered Latino voters. On both measures, Latinos lagged white and black voters. For example, 48.6% of white eligible voters and 71.3% of white registered voters participated in the last midterm election (Lopez, 2011). Overall, one-third (35%) of Latino registered voters say they have given the coming November election “quite a lot” of thought, unchanged from 2010 when 32% of Latino registered voters then said the same (Lopez, 2010). 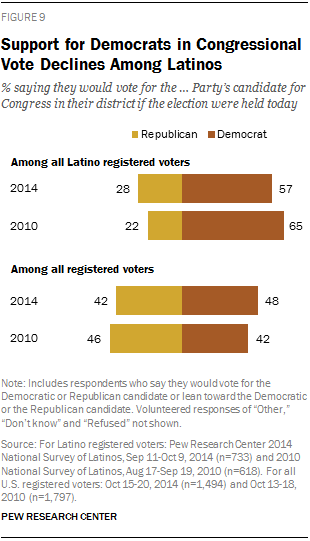 Even so, Hispanic registered voters’ interest in the election continues to lag other groups. In 2014, 59% of all U.S. registered voters have given this year’s election “quite a lot of thought” (Pew Research Center, 2014e). This is little changed from 2010 when half (55%) said the same (Pew Research Center, 2010c). Among Hispanic registered voters, interest in the election varies across demographic subgroups. Those with at least some college education (45%) and those ages 65 and older (44%) are most likely to say they have thought “quite a lot” about the upcoming election. By contrast, voters with less than a high school diploma (26%), those with a high school diploma (26%) and those ages 18 to 29 (28%) are the least likely to say they have thought “quite a lot” about the upcoming election in November. If the election for Congress were being held today, 57% of Latino registered voters say they would support the Democratic congressional candidate in their district, while 28% say they would support the Republican candidate. Overall, Democrats hold a two-to-one margin over Republicans this year. However, the share of Latino registered voters who say they would vote for the Democratic candidate is down from the share that said the same in 2010. Then, 65% of Latino registered voters said they would support the Democratic congressional candidate in their local election and 22% said they support the Republican candidate (Lopez, 2010). Among all registered voters, the congressional vote is split: 48% say they would vote for the Democratic congressional candidate in their district or lean toward voting for them while 42% say they would support or lean toward supporting the Republican candidate (Pew Research Center, 2014e). Support for Democratic and Republican congressional candidates among Hispanic registered voters varies among demographic subgroups, but across nearly all of them, a majority says they will vote for the Democratic candidate in their district. For example, 65% of Hispanic voters ages 65 and older say they will vote for their local Democratic candidate while 22% say they will vote for the Republican candidate. And among younger Hispanic registered voters (ages 18 to 29), 50% say they plan to vote for the Democratic candidate while 34% say they plan to support the Republican candidate. Nonetheless, support for Democratic candidates has declined since 2010 across nearly all demographic subgroups of Hispanic registered voters. For example, among foreign-born Hispanic registered voters, 55% today say they plan to vote for the Democrat in their congressional district, down from 73% in 2010. Even among Hispanic registered voters who identify with or lean toward the Democratic Party, the share saying they will vote for the local Democratic candidate for Congress is down, to 85% today from 91% in 2010. Among young Hispanic registered voters, 50% today say they plan to vote for the Democratic candidate in their district, down from 63% who said the same in 2010. Meanwhile, support for Republican congressional candidates is up among all subgroups of Latinos, but especially so among foreign-born Latino voters. In 2010 16% said they planned to vote for the Republican candidate in their congressional district, but 28% say this in 2014. Overall Latino voters are just as likely as all U.S. registered voters to say they want to see their own congressional representative re-elected this year. Half (49%) of Latino voters say this while 30% say they would not like to see their representative re-elected, according to the new survey. By comparison, among all U.S. voters, 48% say they would like to see their congressional representative re-elected this year and 35% say they do not (Pew Research Center, 2014e). But while Hispanic registered voters and all U.S. registered voters are just as likely to say they want their representative re-elected, U.S. voters overall are less supportive than Hispanic voters of re-electing most members of Congress. One-quarter (23%) of all U.S. voters say they want to see most members of Congress re-elected this year compared with 36% of Hispanic voters who say the same. Nonetheless, large shares of all U.S. registered voters and Hispanic registered voters—68% and 53% respectively—do not want to see most members of Congress re-elected. Among Latino voters, 55% of Latino Democrats want to see their representative re-elected this year, as do 47% of Latino Republicans. As for Congress overall, 53% of Latino Democrats do not want most congressional representatives re-elected. Among Latino Republicans, 45% say the same.